It started out as a way to cover live events during the National Museum of American History’s (NMAH) November 2008 reopening weekend. Following a 2-year renovation-related closure, we knew that the museum’s fans were eager to see the doors reopen. Planned festivities included a dedication ceremony with then-President George W. Bush and a ribbon-cutting opening day celebration featuring General Colin Powell (Ret.). We wanted to provide a fan’s-eye view of the celebration even for those who could only join us virtually. We looked to various social media outlets to accomplish this access, launching a new blog, Facebook page, Flickr group, and Twitter account. The Shorty Awards honor the best people and organizations on Twitter. One NMAH follower shares the reason behind her vote. Armed with a Blackberry, I tweeted play-by-play coverage of the events, saying thing like: “Snow just began to fall on the anxious crowd outside the museum. Just a few more minutes until the doors swing wide open!” Twitter gave us a way to reach not just the few dozen followers we had at the time but, via the magic of RSS, to also quickly update key pages of our Web site and blog without being chained to a computer. Those early tweets now serve as a fascinating archive of as-it-happened accounts. 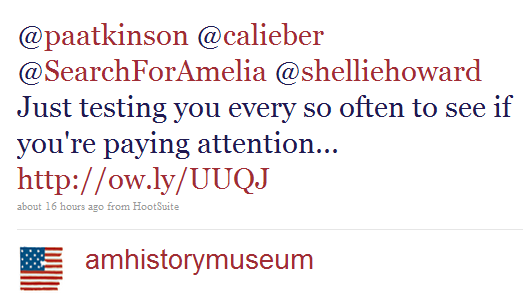 In those days we didn’t know much about what a museum might use Twitter for. We promoted events (come to this! ), the latest blog post (read that! ), a recent news article about us (aren’t we great?!). It was all very narcissistic. We tried having some fun by posting comments from visitors in the exhibition, things like: “Overheard from a man to his child in the Lemelson Hall of Invention: That’s like Mr. Potato Head but he’s Mr. Styrofoam Face.” Slowly we started to get questions from followers—“Why isn’t the Stephen Colbert portrait on view?”— and we shifted to a more conversational style. “We know you’ve been waiting for it . . . and it opens on Friday! What is it?” (Answer: The ever-popular First Ladies exhibition.) The use of “we”— first on the blog and then on Twitter became more comfortable than our usual “The Museum.” We tried posting un facts, “The California gold rush drew wealth-seekers from around the world. More than a third came by sea. http://tr.im/mIQY” but it was hard to remember to craft these on a regular basis. The series came with a built in reminder to look for things to post—what happened today in history? And the soundbite style made them popular with followers to retweet, spreading our account name and links to our Web site farther and wider. We still post links to our blog, draw attention to news, and pose open-ended questions but the “This Day in History” tweets are by far the most retweeted and responded to content we put out on Twitter. There are several other organizations that produce similar online resources on history that happened on specific day of the year. We take advantage of these (the New York Times, History Channel, and Wikipedia Web sites are great sources of inspiration for us) and try to make them unique by connecting them to what makes us special: our world-class collections and scholarship. We try to participate in daily memes (e.g., #museumfactmonday, #musicmonday, #woofwednesday, #thankfulthursday, #followfriday) and these are popular for RTs too. Incorporating hashtags or usernames of Twitterers with high follower numbers can help make your tweet more viral. This “hottest tweets” report is from DailyRT. We currently send an average of 10 tweets per day—this includes “This Day in History,” promotions for events, @ replies to questions and comments from followers, and retweets. The frequency is lower on weekends and can go significantly higher on busy news days or when a good conversation is going amongst followers. Tweets per day can be charted easily using TweetStats. Retweeting content posted by other can be tricky because you are less sure of the accuracy and quality of the information than you are about your own content. When retweet are sent from @amhistorymuseum, we focus mostly on other Smithsonian accounts and a trusted peer institutions (e.g., National Archives, Library of Congress, etc.) We also retweet funny, favorable, and informational tweets from visitors—especially those that include a TwitPic or a link to a blog post. It’s smart to conduct a quick gut check of the person’s past 10 or so tweets (or a handful of blog posts if you’re retweeting a link to one) to make sure the other content associated with that account isn’t offensive or spam. Some museums wonder whether a retweet is seen as an endorsement and in some ways it is. However, we assume that our followers understand that when we RT we’re recommending that particular tweet and not necessarily everything coming from that Twitterer’s account. Social media marketer Dan Zarella published a free report on “The Science of Retweets” (http://danzarrella.com/the-science-of-retweets-report.html). He looked at the factors that make a message likely to go viral including: how many followers the original and subsequent senders have, the content of the tweet (e.g., calls to action, links to blog posts, lists) and the time of day the original tweet is sent. He found that retweeted tweets (a tongue twister!) were more likely to contain a link than not and were sent during business day mornings (EST). NMAH has found that “This Day in History” tweets are more likely to be retweeted than our other tweets, so we try to send them during peek retweet hours and they almost always include a link. It helps to compose your tweet in less than 120 characters because a retweet will contain “RT” or “via” and plus a space and then your username (@amhistorymuseum is 16 characters). Keeping your tweet short just makes it easier for others to keep your original message intact without having to try to shorten it further. Daily and hourly tweet density charts from TweetStats. Targeted follower recruitment: Thanks for visiting! On a daily basis, we run a search for people who have tweeted any variation of our museum name (this search can be automated and results sent to you in a daily digest with services like TweetBeep and SocialOomph). We compile the usernames for anyone who references a visit to the museum and schedule a tweet to be sent late at night with the following message: “@username1 @username2 Thanks for visiting! What did you like most/least?” We can usually fit all of the usernames in one tweet (sometimes two) and we send it late at night so that most of our regular followers won’t see it every night and be annoyed. The people who are @ replied in the message will see it in their list of mentions, so the time of day makes less of an impact on the recipients seeing the message. With this strategy we’ve seen a very high level of response—and some fascinating comments (both positive and negative). In addition, it is our sneaky way of letting people who tweet about us know that we have a Twitter handle. It takes only a minute to put together this daily message and it helps our follower list growing by striking while visitors’ minds are fresh from the visit. Much debate rages about who within a museum should bear responsibility for tweeting. The marketing department? Curators? The tech folks? In our case, it was the new media department who had the idea to launch a Twitter account, and so it has been that department’s responsibility ever since. The original idea was for new media department staff (who manage Web, online outreach, and digital interactive projects) to oversee the account, which would be accessed by contributing staffers from various departments including public affairs, visitor services, and public programs. Our very first tweet, a clever take on Samuel Morse’s famous first telegraph message, sent over 150 years earlier, in 1844. 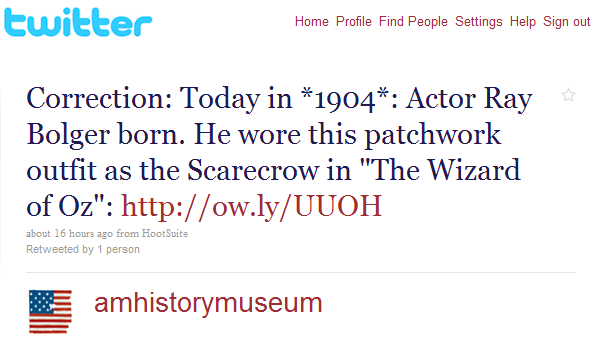 In theory, the @amhistorymuseum account should be a shared responsibility reflecting viewpoints from around the museum. It makes sense for the new media department to play an advisory role in social media efforts because the team is the most knowledgeable about online trends and effective communication across various mediums. But there is no reason—technical or otherwise—that creating interesting content and interacting with Twitter users should be solely the responsibility of that department. The museum uses HootSuite to manage its Twitter accounts, which should make collaboration by multiple staff a fairly straightforward process. In reality, the account has been managed by one new media staffer. Other staff have access to the HootSuite login and have tweeted on occasion. The know-how is there (at least for some) but the sense of responsibility is missing. What is the reason for this? In part the problem seems to be that it simply isn’t thought about—if you don’t tweet consistently, it simply doesn’t occur to you to do it. In order to ensure that the museum’s Twitter efforts are proactive and sustained, more staff will need to feel individually responsible on an ongoing basis. Whether this means assigning point people on certain days or asking staffers to be responsible for a given topic or area (e.g., visitor services would be responsible for responding to visit-related queries) all days remains to be seen. Oversight of content put out on Twitter is generally more lax than it is for the museum’s other online outreach efforts (e.g., monthly e-mail newsletter, blog posts). Most of the time, the museum’s tweets are comprised of text and images already vetted for the Web site and creatively repurposed for Twitter. For newsy topics that aren’t already represented on the site, the public affairs office is consulted (via a quick phone call or email) to make sure the tone is appropriate and facts are correct. On a few occasions a series of tweets on a given topic (e.g., Julia Child’s kitchen facts) has been planned; in those cases the content has been crafted and then sent to curatorial units for fact-checking prior to posting. This laid-back approach to editorial review is unique to this platform. The museum’s blog, for example, has a team of almost a dozen reviewers and a formally documented, structured process. The reason for this difference is unclear. It may simply be due to Twitter being off the radar for most museum staff and so it hasn’t occurred to them to demand prior review. No matter how diligent you are about spellcheck and other content quality control, you will make mistakes. On a handful of occasions, we’ve transposed numbers in our history dates, rendering our “This Day in History” fact incorrect…and usually hysterically so. While Twitter allows you to delete tweets, that doesn’t necessarily that they disappear from the internet entirely. If you can, issue a correction. And don’t forget to have a sense of humor. In the beginning, NMAH only followed other Smithsonian accounts. There was some concern about following a user looking like an endorsement—particularly because their Twitter image appears on your account’s main page. The museum doesn’t put corporate logos on our Web site and many Twitter images are essentially logos. Over time we added other history organizations and museums (nonprofit) and a few historians/academics. During a summer promotion of Julia Child’s kitchen at the Smithsonian, we launched a blog series that featured a staff member trying a new recipe each week and asking readers to try them too. The promotion coincided with the release of the Julie & Julia film and we wanted to maximize the feedback we’d get from readers. There is a critical mass of foodies and food bloggers on Twitter who we thought might be able to help us spread the message, so we experimented with pitching Twitter accounts. First, we researched lists of food-related Twitter accounts—particularly those with a large network of their own followers—and began following them. Many Twitter users automatically follow back—in the least, they are notified of your follow and their interest may be piqued. This strategy was very effective for getting new followers interested in a specific topic. Once someone is following you, it is possible to send a direct message via Twitter for more private requests. We pitched a handful of Twitter users this way, sending direct messages with a request to inform their readers of our new weekly blog series about trying Julia Child’s recipes. This was met with some success. Now that the series is over and our concentrated focus on Julia Child promotions is over, the question remains whether these followers will stay on when the content is less focused on food; we also wonder whether we should unfollow this group, as foodies are disproportionately represented on our “following” list. We began to follow other accounts more widely during the summer of 2009; the museum’s followers began to rise drastically around the same time. Every few months, the idea to create a new Twitter account (or Facebook page, etc.) comes up. Whether its an exhibition team or a particular department, the concept is usually the same: wouldn’t it be better to have an account that sends highly-focused tweets on a particular topic? Wouldn’t we then be better able to target specific audiences? The answer to the second question is probably yes. Whether or not this is a better strategy is a different story. The museum’s main Twitter account now has over 5,000 followers and it took quite some time to build that level of following. Will we see more of a response by sending jazz-related tweets from this main account during Jazz Appreciation Month (April) or by creating a new account that tweets only about the topic of jazz? Certainly there is a large enough audience of jazz lovers to justify a separate account. A more important question, however, is: who is going to maintain this account? And will they be able to sustain it? We see social media is an opportunity for us to create long-lasting relationships with people. So our current thinking is that it is not a good placement of efforts to to create an account that will be highly active for a month or so and then go dormant. So far there have only been two cases that seemed to justify separate accounts. An @explorehistory handle was created for outreach specifically to an educator audience. The team of staff responsible for producing the Smithsonian’s History Explorer Web site (http://historyexplorer.americanhistory.si.edu) has taken on the responsibility of creating content and interacting with teachers in a sustained and ongoing way. Similarly, the Lemelson Center for the Study of Invention and Innovation already has in place a focused and ongoing program of activities that attracts a particular audience. The @lemelsoncenter account tweets about events in patent and invention history and links to invention and creativity-related news. The @explorehistory tweets more regularly (at least one tweet a day) and its exponential growth is probably related to this sustained effort. Follower growth for @explorehistory and @lemelsoncenter accounts. Chart from TwitterCounter. The HootSuite Web site (and iPhone app) allows you to easily manage multiple Twitter and other social network accounts. It offers link shortening, photo uploads, link click stats, and scheduling features. In addition, it incoporates Twitter list and keyword search functionality, allowing you to create customized columns that filter the Twitter streams you following into useful categories. The National Museum of American History follows the evaluation plan steps outlined in the “Measuring, Analyzing, and Reporting” chapter of this book. A sample dashboard report is included here for December 2009. An abbreviated version is also shown as an example of a less time-intensive evaluation and reporting process. [image url=”http://danamus.es/wp-content/blogs.dir/3/files/2012/12/twitter4museums-239×300.jpg” title=”Twitter for Museums” alt=”Book, Twitter for Museums” alignment=”left” margin_left=”0″ margin_right=”0″ margin_top=”0″ margin_bottom=”0″ border=”smallBorder” shadow=”1″ width=”239″ height=”300″]I contributed two chapters to the book, Twitter for Museums. Above is the chapter outlining a case study at the National Museum of American History. The other chapter, “Measuring, Analyzing, Reporting” is also available. This practical, authoritative and comprehensive new guide provides all the strategies and tactics you need to make this powerful tool work for your organisation – efficiently and effectively.